Most of us only ever catch fleeting glimpses of coyotes or foxes, and these brief encounters can leave us wondering what species we saw. Besides the domestic dog, our state hosts three members of the family Canidae, a word that comes from the Latin word for dog, “canis.” Here’s a primer on wild canines in the Commonwealth. Of the three species, this is the one you’re most likely to see. A highly adaptable animal, it’s found across much of North America, Europe, and Asia, and survives well in built-up environments. 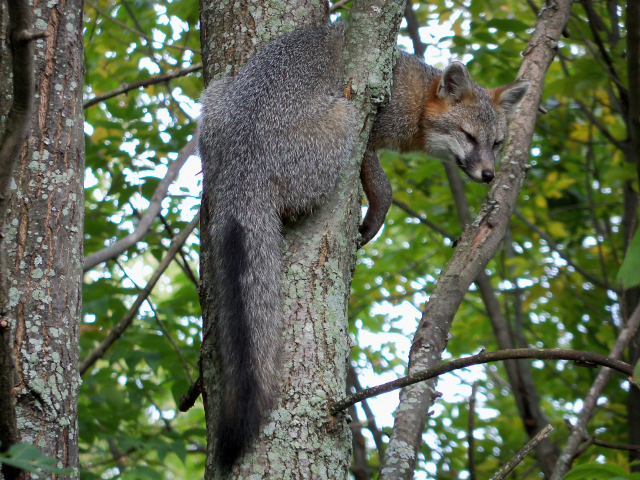 This amazing animal isn’t just a grey-colored red fox—it belongs to a different genus, or group in the animal family tree, and has some unusual traits. Like a cat, its nails are retractable, and it can climb trees and jump from branch to branch. It’s more rarely encountered because it doesn’t wander as much and tends to stick to its forest territory. Adult coyotes are more than double the size of gray foxes, and coyotes in the eastern US tend to be bigger than those in the west. 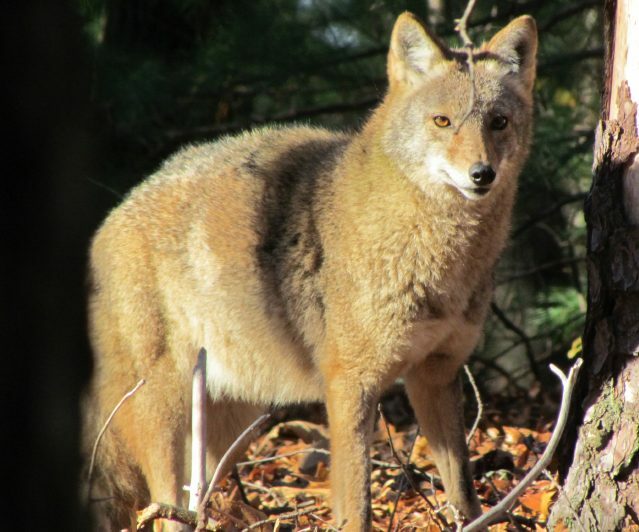 Evidence suggests that the coyote interbred with the eastern Canadian wolf as it spread into the northeast in the past century. The resulting animal is larger than the western coyote, and has some wolf-like characteristics, including smaller ears and longer legs. However, it’s still much smaller than the wolf, which was wiped out in Massachusetts by the early 19th century. The coyote is very adaptable and can be found in developed areas, but tends to be shy and elusive. Learn more about coyotes on our Nature and Wildlife pages, and share your wild canine sightings with us here and on our Facebook page. This entry was posted in Nature Notes on October 29, 2014 by Rosemary. Oh, sorry, it’s me again, the residential street is in a suburb of Chicago. About a half hour from the heart of downtown! Thank you! 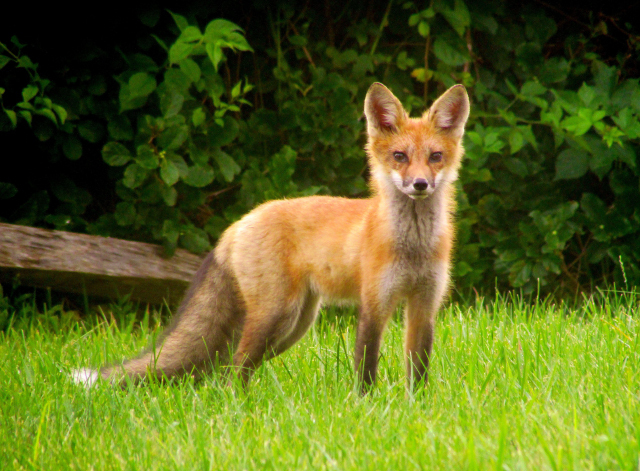 This was very helpful and quite informative, I just saw a red fox in mid afternoon on a residential street! I hope the little guy gets back to his hiding place safely, but he sure was amazing to see! A fox or coyote? First I saw 4 small grey pups I thought were kittens but had shorter tails then the mother which was short grey with red and black colors dark legs pointed ears. I live in the country and have all kinds of wildlife Just wondering which one were they fox or coyotes?? We see Coyotes quite often in the field behind my house in Bradford NH. I finally saw a Red Fox this morning. Had a beautiful white tipped tail, and definitely smaller then the coyotes. How come some red foxes have black tipped tails? Why is that? Swift foxes have white tipped tails. The origin comes from the nahuatl language, the ancient Aztecs called these animals “coyotl”. There are plenty of word that include the name of coyotes in that language, such as Nezahualcoyotl, Coyoacan, etc. I have a pair of coyotes that had pups behind my house. They aren’t scared of me. I don’t leave my 5 year old alone but should i be worried ? They are not dirty animals. But still keep kids away from them. Yes, they are very dangerous! Don’t be to relaxed with the calm demeanor! probably ok with a fox around but not of a coyote. Then why don’t you make your own website? We recently found a baby animal we had no idea what it was. We thought it was a badger with its puged nose and rat like body. It was ecxremly fluffy. It has a white tipped longish tail. And a winish cry that occasionaly turns into a deep bark. We’re guessing it’s a about a week old since its eyes are barely opened. We found it next to a fox den and my dad even claims he saw a fox close to it that got killed by are gaurd dogs. I have plenty of pics and videos of ” Tod” after Tod from fox and the hound, I even have videos of its barks if necessary. We’ve had people, professionals, say fox and others say Coyotoe. I’m still confused so if someone could please give me their opinion that would be great! Thanks!